Originating from small town roots in the UK, Sidney Hardy entered the hospitality industry in pursuit of his love of food. With 30 years experience under the belt, he has taken on various roles in London, Singapore and Seoul as well as in Chinese cities such as Shanghai and Shenzhen. Joining the Hyatt Hotels corporation 2002 as an Executive Chef and later moving to Tianjin as General Manager of the Hyatt Regency Jing Jin City Resort and Spa in 2013, Hardy has a unique perspective on how the hospitality industry in China has changed over the years. 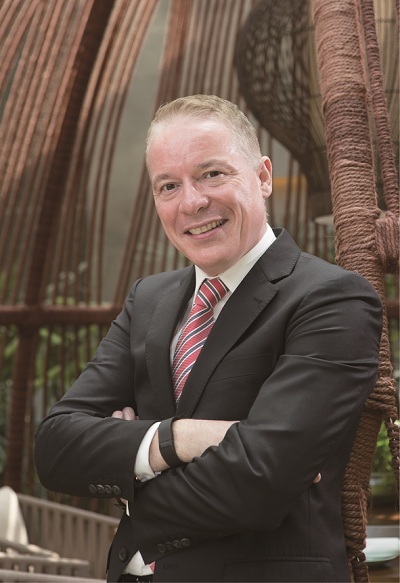 This month, we sought his insights on his career so far and what the value of authenticity means for the future of the hotels industry in Tianjin. 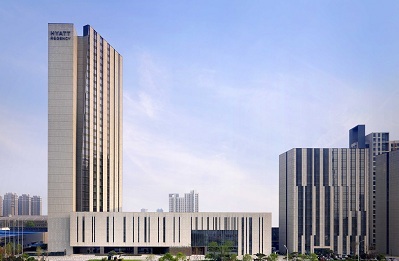 The first ever Hyatt hotel in Mainland China was established in Tianjin back in 1986. How does it feel to be running Hyatt Regency Tianjin East as a landmark hotel establishment steeped in history? It's a wonderful feeling! Working for the Hyatt for so long, I came across colleagues who always talked about Tianjin and what it was like in the eighties when it was first established. Obviously, it's very different now but there is a real sense of legacy, not only in the city, but in broader China. Overall, I feel very lucky to get the opportunity to come and work in Tianjin. Prior to your current role, you worked as General Manager for the Hyatt Regency Jing Jin City Resort and Spa. What are your thoughts on the current development of the luxury, high end hospitality industry in Tianjin? In Tianjin, the guests are spoilt for choice as there are so many wonderful hotels and facilities. The facilities in this city are world class. This also means that our competition is very strong so we insist that we deliver services and products that are actually world class in order to compete. If you look at the quality-to-price ratio in Tianjin, itÃ¢s very good for the guests - so they should seize these opportunities whilst they can. Tell us more about your typical clients and customer base. Who do you seek to attract to the hotel? To survive in cities like this, we must seek to attract each market segment. From a food and beverage perspective, what we offer at our restaurants is targeted at the local population. We are very authentic in what we do. Our price points are very reasonable. Our direction is that we set our price points at a competitive level but we over-deliver on service and quality. Our culinary concepts are also very authentic. For example, a Tianjin dish is an authentic Tianjin dish. We invest in chefs in order to be able to deliver on that. In terms of business customers, Tianjin is of course a manufacturing hub so many of our guests work in various manufacturing industries around the outskirts of Tianjin. As a result, we not only service guests from Mainland China but also from different regions in Asia. From a transport perspective, our location is very convenient to get down to these areas because of our proximity to the highway. There is an abundance of banks in Tianjin so many of our regular clients come from finance sectors but we also service a range from manufacturing and pharmaceuticals to insurance. In a market like this, you must be multifaceted to survive. What does the Hyatt Regency Tianjin East offer specifically for its customers? For our guests, we do not offer anything that we don't think we can do. We really concentrate on authenticity. Authenticity is the key to success, especially from the product perspective. We are very proud of the hotel. The design is very modern and the finishing of the products is to a very high standard. Many of the people who come here are very impressed with the hardware, design and layout. It's very different to anything else in the city. Also, our restaurant 'Wok in the Garden' is very unique. You will not find anything else like it in Tianjin. We're also very proud of the fact that last year, we were number one for customer satisfaction in the Asia-Pacific region. In Tianjin, the people are very warm and friendly. One of our key points is that we care for our staff so that they can be their best. We want people to feel comfortable with their work and excited about what they do. We select the people that are authentic in the hospitality they serve. We unleash their potential and let their character show. The care aspect from our associates to our customers is very high. We always get very good comments on this. We really focus on making sure our associates have the tools to enable them to carry out their jobs, so we spend a lot of time on training to make sure they are comfortable delivering top quality service. We like to foster this type of skill and mentality so that they are always anticipating what the customer needs. Is attracting top line talent difficult in Tianjin? For the hospitality industry in general, it's always a challenge because there is a limited pool of available talent. But in Tianjin, we have been a bit luckier because the local people are very homely and don't tend to move so often. With that comes long-term experience because people stay in the hospitality industry longer so this is a real advantage for the Tianjin hospitality industry. We have a reputation of caring for our associates. We look at them as partners. We want them to be challenged and professional, but also happy in their own development so they feel value in the business model. We want them to take the hotel to their heart. Coming from a food and beverage management background, what were some of the challenges you faced when you first began managing a hotel and how did you overcome them? Under the Hyatt brand, in each position you are always given a lot of responsibility, as there is a real focus on developing people. We're always looking at how we can get individuals to extend their area of responsibility, analysing the strengths one has to the benefit of the hotel and operations. 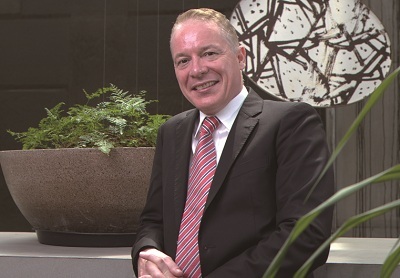 When I stepped into the role of General Manager, it was because I knew I wanted to challenge myself so I kept my mind open to learning new skills which allowed me to transition to this position much easier. In a food and beverage role, you must be very practical. You are always working with people so learning how to interact with people from all walks of life happens on a constant basis. In places like China, you must always be aware of what is going on and be very hands on. You cannot manage by remote control. If you want to be successful, you must be with the team and get involved. All of these things allowed me to transition into the role well. How do you manage and motivate your staff to deliver their best? We do Hyatt feedback sessions on a weekly basis with each department. Senior Managers along with two or three members of staff from different levels get together and we discuss ideas about what else we can do, talk about what has been successful in the past and what else can be improved. We also have a Hyatt Talk on a monthly basis. Hyatt associates are chosen at random and are given the opportunity to talk about any ideas they have for our guests or owning company. It's a two-way process. Feedback is important and is an important motivating tool. The main motivator is that for our associates, we offer a future. It isn't a case of you're stuck in your role. If you're motivated to challenge yourself and learn new things, there's plenty of opportunity ÃÂ¢ especially at this time in China because hospitality industry development is so huge. What have been the main changes in the hospitality industry through your career? In the hospitality industry, it is important to bring a drive to change things and push boundaries so things don't just remain in the same stale way. This also comes with competition. Having worked in Tianjin for nearly two years, the changes I have seen in this space of time have been amazing. Promotions and the way people have been marketing their hotels have really changed in the last year. For us at the Hyatt, we think it is very important to engage with the local community in a way that suits their lifestyle. Now, everything is accessible from your smart phone. The first thing people do in the morning is look on Dianping or Weibo so it is important to interact with them in a way that is fast and easy to understand. This is definitely part of our direction going forward. 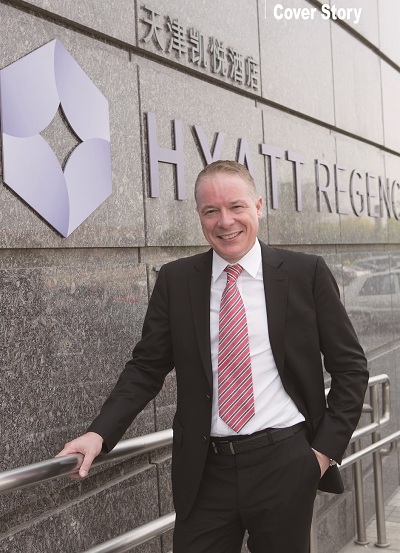 What makes the Hyatt Regency Tianjin East stand out from other high end hotels in the city? We are always looking at different ways to engage and bring exciting new products and events to our customers. Recently we ran a very successful event called Pastry Art. We worked with famous local artists in conjunction with our pastry chefs and set up an art table made entirely from pastry. For Chinese New Year, we did a Show Bar event with bartenders creating an exciting atmosphere, showing off their skills with bomb shots. We always like to do things in a way that is new and different in the market. We also like to produce themes and concepts for the whole hotel and injecting them into different elements of our products. For example, in March we went with the theme of 'ladies'. This included a celebration of ladies throughout the hotel which could be seen in parts of our spa and room packages, the running of yoga sessions, as well as special menus and other activities. In coming up with ideas for these themes, we look to the current market and identify what has and hasn't been done before and run brainstorming sessions. We like look at how things can be done in a 'Tianjin way'. What types of things can we look forward to from the Hyatt Regency Tianjin East? May will mark our two-year anniversary here in Tianjin, as well as 30 years of the Hyatt brand. We will be inviting some of our associates who first worked for Hyatt 30 years ago and have now retired. We'll also be looking at Tianjin 'Before, Now and in the Future'. It's a very iconic period for Hyatt right now. What is the future for the hospitality industry in China and Tianjin? Hotels are opening everywhere but brands coming into the market will become very important. A key thing is that we must live to our brand, deliver what we promise and be true to our brand identity. Customers are becoming smarter and more travelled. They can pick up their phones and see what a good brand is supposed to be in somewhere like Los Angeles or New York straight away. When people travel, apps like Dianping will instantly notify you of restaurants in the area and people can see reviews and comments. If people want to seek information, they can find it instantly so brands need to step up to the plate and ensure what they are delivering is up to an international standing. Going forward, our industry is still maturing. Although the economy is going through a bumpy ride, I believe the long-term future for the industry is very positive in China. China is exciting. In the nine years I have worked here, there have been so many exciting changes. It is a pleasure to work here because the people are so positive. Their automatic default position is 'How can we make this work?' or 'How can we bring this forward? ', which is a breath of fresh air every day. As a result, I'm a big believer that the future of the hospitality industry is here in China.